Neil Bunting from Cage Cricket South East took the game to the West Midlands on 11 March 2017 when the members of St George’s Disabled Cricket Club and coaches from Shropshire County CC had their introduction to the game. 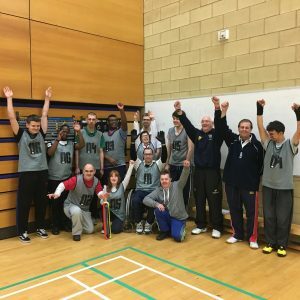 The event took place at Telford College of Art and Technology and was arranged by the Cricket Federation of Disability Sport. The participants had a fantastic time and Neil was impressed by their skill and enthusiasm. Some of the shots so powerful we lost a couple of balls! The players from StGDCC are very keen for further opportunities to play Cage Cricket.